This is a high quality wheel stand with RGS shifter mount built with for your Logitech G25, G27, G29 or G920 racing wheel. The wheel, pedals and shifter bolt securely to our wheel stand. 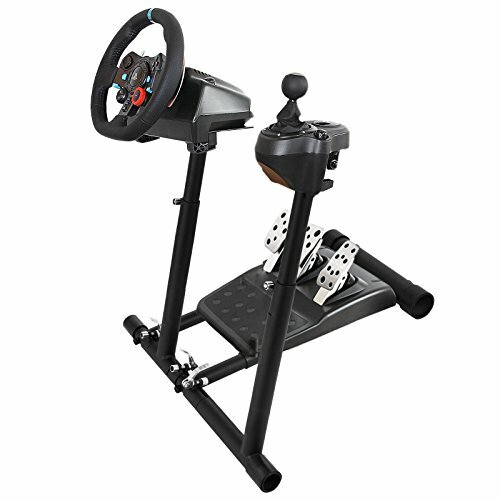 The Logitech wheel, shifter and Pedals are NOT included. Patented. Built to last a lifetime. Stand comes fully assembled; just attach your gear. Steering wheel stand with clear pedal access, no bar in the middle block the pedals. Stand comes fully assembled; just attach your gear. So you've got rock solid frame, feet on the pedals, hands on the wheels. Your mind is on the awesome sound and graphics of the game. The rubber feet combined with the steel tubes make for a smooth driving experience, stable, portable and adjustable.